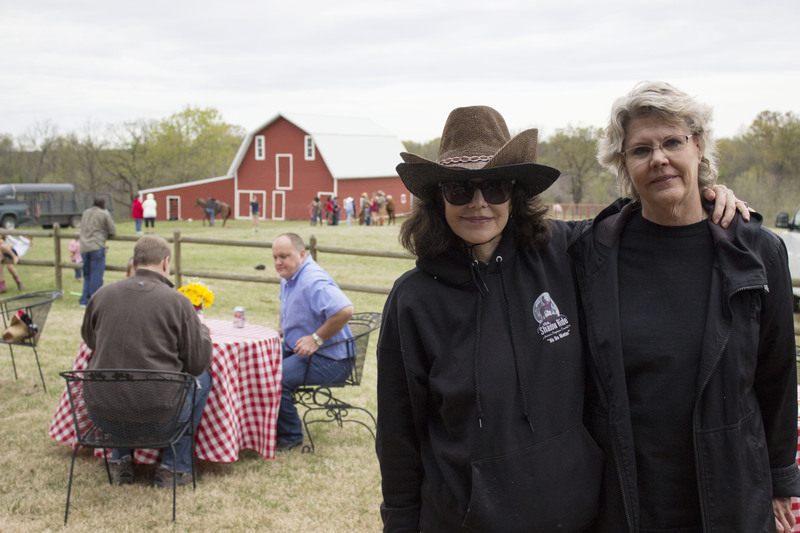 (L-R) American Porphyria Foundation Founder/Executive Director, Desiree Lyon, and Mary Hull at the fundraiser event hosted by Hull Ranch on April 11 near Pawhuska. On April 11, Hull Ranch hosted a fundraiser lunch with a silent auction as part of the kick-off of a horseback ride cross-country at night dubbed “the Shadow Ride” to bring awareness to a the disease porphyria. The event’s proceeds went to the American Porphyria Foundation, whose founder, Desiree Lyon, attended the event. The Dustin Pittsley Band provided the entertainment and there were trail rides and bouncy-houses for the kids. The Hull Ranch fundraiser was hosted by Mary and Tom Hull, whose daughter, Dr. Lisa Kehrberg, a primary care physician in the Chicago area, was diagnosed with an acute type of porphyria in Sept. 2013. The fundraiser’s purpose is two-fold: to raise funds for porphyria research and to bring attention to the disorders to increase proper and prompt diagnosis, which can be identified through a simple blood and urine tests. Approximately 2,000 people in the U.S. are diagnosed with a porphyria annually, Dr. Kehrberg said. There are eight distinct types of porphyria each with its own set of signs and symptoms. Some types of porphyria create skin sensitivity to light, called cutaneous. Michelle MacMeeken suffers from this type, called EPP (erythropoietic proptoporphyria). For this reason, her husband, Scott MacMeeken decided to ride horseback across the U.S. at night, called “The Shadow Ride” to bring attention to the underdiagnosed conditions. Porphyrias are considered an uncommon genetic disorders according to Dr. Sylvia Bottomley, M.D. an expert on prophyria who attended the fundraiser and specializes in Internal Medicine and Hematology at the University of Oklahoma College of Medicine, where she is an Emeritus Professor. The symptoms of the type of porphyria from which Dr. Kehrberg suffers are: severe abdominal pain, weakness and numbness, back pain, leg pain, fast heart rate, high blood pressure, respiratory and muscle weakness. Now age 40, Dr. Kehrberg had her first attack in her teens, and has suffered from the disorder for 22 years. Her diagnosis only came recently, however. Delayed diagnosis is typical, Dr. Bottomley said. “This is why awareness is important because I think porphyria is one of these things that patients take to their doctor and they are not aware,” Dr. Kehrberg said. Dieting and stress are triggers. Dr. Kehrberg said an attack began after her brother died unexpectedly. She had also been dieting during this time. “By the time I got the diagnosis, I was going to die or get diagnosed,” she said. “A year and a half ago, I got really sick and ended up hospitalized [in the Chicago area] with all of those symptoms. This was like severe, severe abdominal pain and high blood pressure. “The first hospital did not recognize it despite multiple tests … and then they discharged me; but I went home and after a few hours I went right to another hospital after that.” She was properly diagnosed at the second hospital, but the effects of the disorder have been life-changing. The usual triggers for attacks are: not eating, many medications, hormones and alcohol, Dr. Kehrberg said. Kehrberg, said she had inherited porphyria from her biological father’s side of the family. (She is Mary Hull’s daughter from a previous marriage, adopted by Tom Hull.) There were a number of people from that branch of the family tree who died from porphyria before the current treatment was developed, she explained. “If you are not diagnosed, you can die from porphyria,” Dr. Kehrberg explained. Porphyria can also cause mental confusion and even coma, Dr. Bottomley added. It is not a cure, however. “It’s only supportive treatment. About a dozen patients with very severe porphyria have been cured by liver transplantation,” she said. “Genetic defects might be cured by putting new genes in and no gene therapy has yet been accomplished in humans,” Dr. Bottomley explained. For the ten percent who do experience symptoms, almost always the triggers mentioned bring on acute attacks of the condition. Dr. Bottomley said. “In the case of alcohol abuse, you can’t manage a patient who drinks. That is because alcohol is metabolized in the liver and the acute porphyria enzyme defects are expressed in the liver. It is here where PBG and ANA accumulated that are toxic to the nervous system.Our nervous system controls motor, autonomic, sensory and brain functions.” Any or all of these functions can be affected. Glucose (carbohyrdrates) consumption can reduce symptoms of porphyria, Dr. Kehrberg said. Being in hematology caused her to pay attention to related conditions. She began her career in 1961, she said. “In those days, my lab was the first in the state of Oklahoma to also measure the iron and Vitamin B12 levels in the blood of patients. Dr. Watson has since passed on, but Dr. Bottomley said, she learned many valuable skills in his porphyria lab, which she then used to diagnose patients with porphyria in Oklahoma over the years. To conclude, Dr. Bottomley explained that while the causes of all porphyria are now clear at the DNA level by a host of mutations affecting the enzymes of heme-biosynthesis, much research is needed in the field. To donate to the American Porphyria Foundation, write to: American Porphyria Foundation, 4900 Woodway, Suite 780, Houston, TX 77056. To learn more about the condition, visit their website: http://www.porphyriafoundation.com.